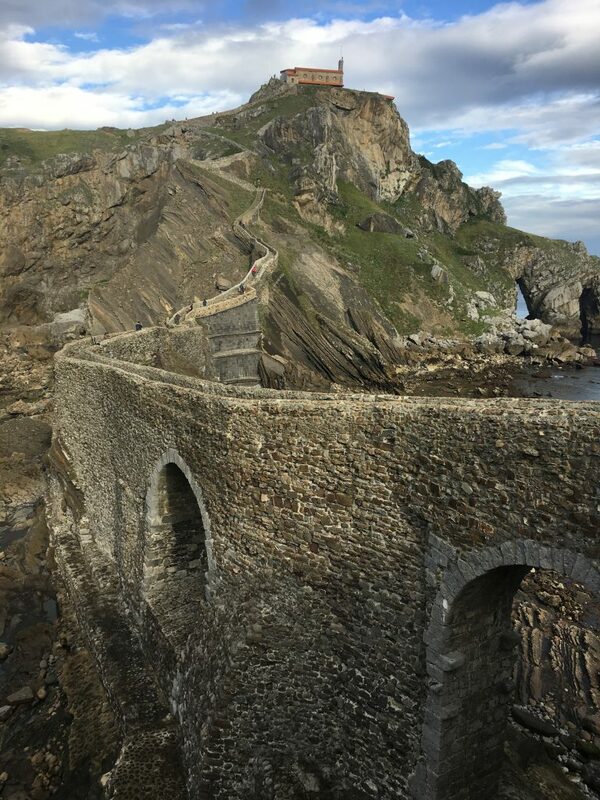 The reason for our slight back-track was to visit San Juan de Gaztelugatxe, a small islet with a chapel on the top, linked to the mainland with a man made bridge. This islet is particularly famous at the moment because it (or more accurately the stair that leads to the top) have featured in Game of Thrones as the steps to Dragonstone. 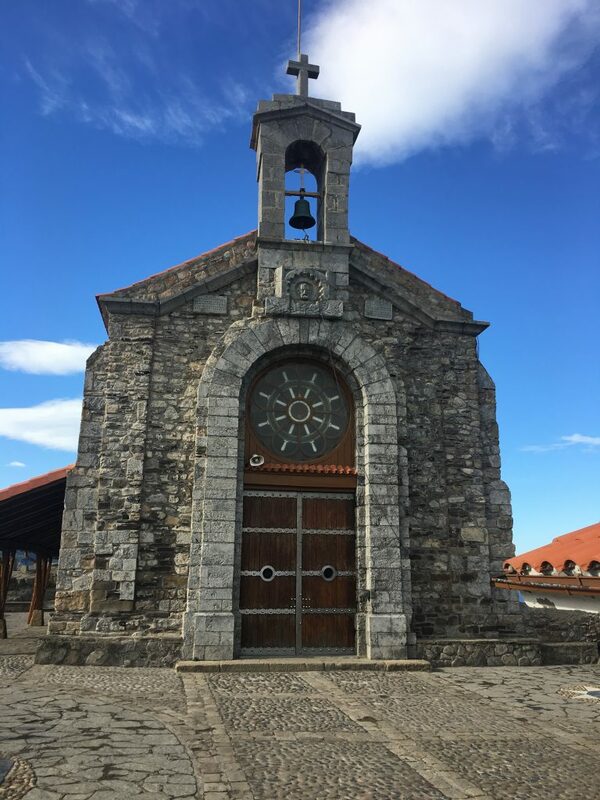 We drove from Bakio car park to park alongside the road at the Mirador Merendero – a parking spot we had looked for the evening before and had been unable to find due to a road being closed and the sat nav not being aware of the new road. From here it was an easy couple of miles walking to our destination along the old road. The old road had obviously not been closed for long but was suffering from imminent collapse with large sections cracked and broken away, slipping down the hill. The evidence of activity to shore up the road was everywhere but presumably they had decided that the easiest thing to do was to start again. 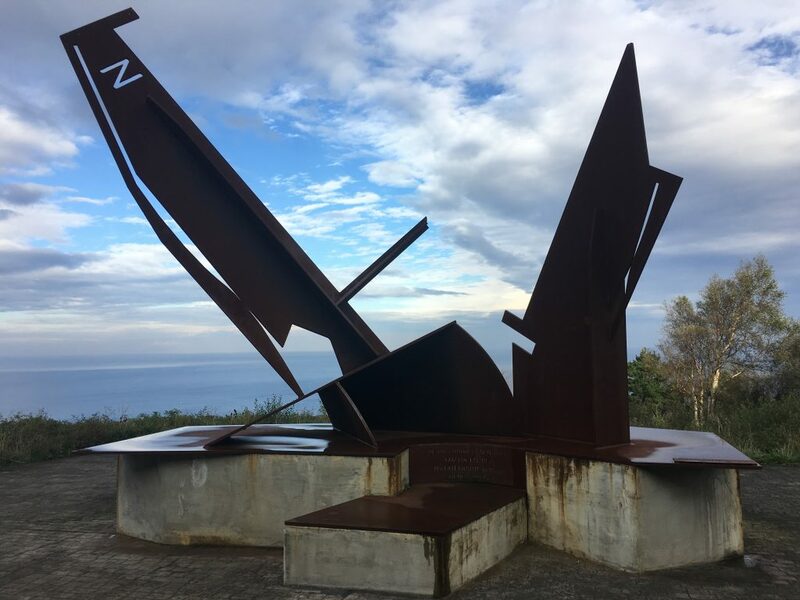 On this road was a memorial to members of the Basque Auxilliary Navy who had served in the Spanish Civil War; a shame to think it will be visited less now that the road is closed. The island was very picturesque with it’s steep and winding staircase looking far more difficult to climb than it actually was. At the top we wandered around the outside of the chapel (it was closed to the public) and took in the views. There is a shelter here, but we didn’t need it as the sun was shining so we sat on the wall and watched other people arriving and ringing the chapel bell three times for luck. From the top of the island we could see down into the clear bluegreen water where there were many fishes swimming. 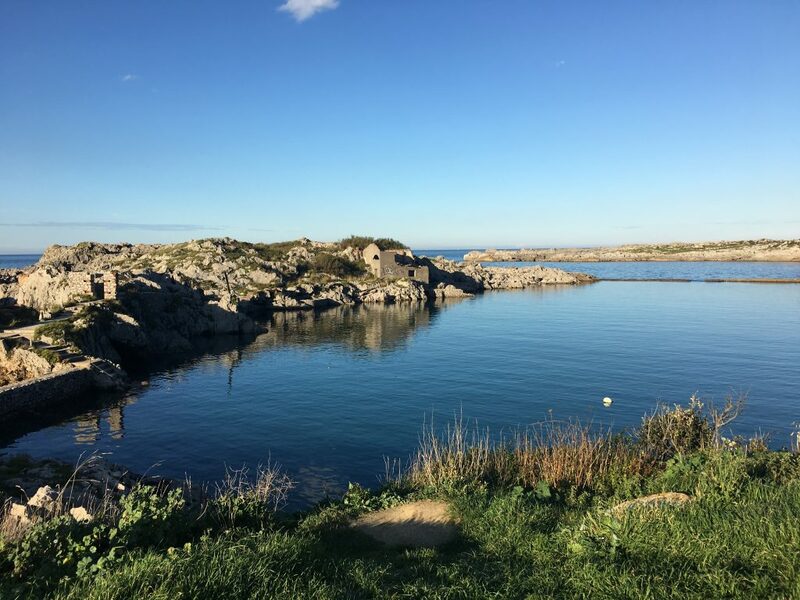 Later that day we went back to Bakio and I went for a snorkel from the beach where I saw more fish swimming around the rocks in the bay – it put Paul in the mood for a bit of fishing so we decided to move on to a parking spot which looked like it had potential for fishing. We parked by the coast at Islares, just under the main A-8. The village had the feeling of a previously popular tourist resort that had lost it’s charm due to the proximity of the main road, but down at the parking area it was easy to ignore the road and just enjoy the backdrop of sharp limestone cliffs and crystal clear waters. Again we could see fish – in fact the helpful Spanish fishermen kept pointing them out to us, much to Paul’s frustration – but they just weren’t biting and Paul came away empty handed.